While home getting prepared for my wedding this summer, I had time to build some decks, but only time to get one finished and ready to play. I gave this Minotaur and Monster tribal build a shot against my brother. In the first game I kept a 4 land hand and played Ruinous Minotaur, played Mogis on turn 4 and Gratuitous Violence on turn 5 and swung for 14 that got blocked. My brother had barely mounted an offence with some enchantments, a Seedcradle Witch and an Elvish Soultiller. Next turn I played and equiped a Demonspine Whip and swung for 20. And the following turn an Inferno Titan cleared the way for the win. We tried it again. This time my brother led with Rhys and followed with a Priest of Titania and a Wirewood Channeler. I played a bunch of minotaurs, including Kragma Warcaller, but his Elvish Promenade was making blockers. Both of us built up armies and tried to get an advantage. I had him down to 2 life, but his World Queller cost me my Rage Reflection, and he was able to use Kamahl, Fist of Krosa to pump for the win. This deck is pretty much all of the playable (and some unplayable) Minotaurs, plus a smattering of Giants, Cyclopes and other theme-y monsters, and then lots of ways to double damage and attack hard. It doesn’t take a lot of thought, but as the first game shows, Mogis can be a pretty deadly threat. This was the debut for Lorthos (aka, The Freshmaker, aka Mr. Tentacles, aka Dr. Octopus) and his beasts of the deep blue sea. I had a lot of lands in my opening hand, which was great. Among them were Coral Atoll and Sveylunite Temple. Also in there was Quest for Ula’s temple, which I charged up. Karador played Braids, which ate my lands, which was sad. Balthor played a Coat of Arms. I played Tidal Influence. Balthor’s Oblivion Stone made life sad by taking my Quest (which did get me a Sealock Monster). Mimeoplasm became a Hornet Queen. Balthor got activated with a bunch of things in the graveyard and it caused me to sacrifice Lorthos before he could make with any tides. Karador started with the discard tricks. Sacrificing Mindslicers to Vish-Kal and other shennanigans with Sadistic Hypnotist. Mimeoplasm Increasing Ambitions for Praetor’s Grasp, which goes and gets an Urborg from someone. 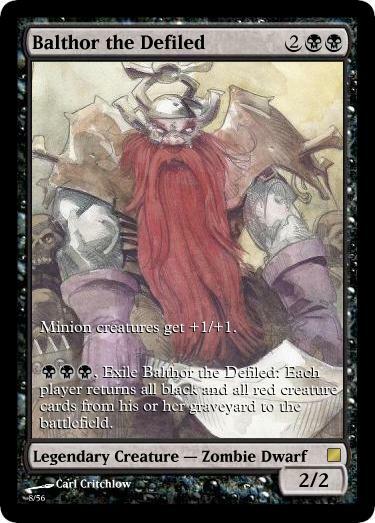 Balthor is having issues with Mana Crypt (which is always funny). I hung on, but was never quite able to cast anything of value. The endgame got pretty silly, I don’t even remember who won the game (other than Not Me), but it was a lot of fun. The Karador Deck is one that I’ve played against many times (though not as often as Balthor). It is an All-Creature deck and pretty cool. You can see it here. This is an ultra-mono sea creature theme deck. The goal is to beatdown with sea creatures. There are no Merfolk allowed because that would be too easy. Cephalids (since there aren’t enough Octopodes for Octopus Tribal) are cool, and my favorite little Crustaceans, the Hominids, also are invited. Homarid Spawning Bed was actually the inspiration for the deck (as one of my favorite cards from Fallen Empires), and it’s a good way to get rid of things like Leviathan, Polar Kraken, etc when the upkeeps become too messy. The Serpents aren’t really natural creatures, but they can be played for free with Ula’s Temple. I’m trying to decide if Nykthos counts in an Ultra-Mono deck. I start with a Hasty goblin (courtesy of Chancellor of the Forge) and a Single land, and I don’t do a whole lot in the early game. Maelstrom Wanderer comes out extra fast and brings a Howling Mine and a Mana Doubler with it. Selenia has a Bloodchief Ascension and Sorin of Innistrad as well as a Tainted Sigil. Some how Maelstrom Wanderer is cast again into Akroma’s Memorial and Viscious Shadows. Someone blows a Memory Jar, and for once, I don’t lose all that much to it. Lazav, by this point has been a Bloodgift Demon, Platinum Empyrion and becomes a Sylvan Primordial. Maelstrom plays Show and Tell (Myr Battle Sphere, Oricish Oriflamme for me, Lightning Greaves and Eternety Vessel). I get out a Blood Moon (which later dies to a reanimated Sylvan Primordial), Ensnaring Bridge, Meekstone and Goblin Bombardment (which gets taken by the Wanderer so it can be sacced to be re-cast). MW is recast bringing Eternal Witness and a Brutalizer Exarch (which hides Sorin). I dump stuff out of my hand, use tricks to give trample and haste to things and then cast Insurrection, but Marton and Signal Pest get killed, so I only end up doing 14 damage. Maelstrom Wander casts an Insurrection too, Kills Selenia and sacs all of the things to the Bombardment. Wanderer gets cast again for something that doesn’t get played and a Font of Mythos. I draw into Firecat Blitz and realize that I have just enough Mountains in play to cast it and go pretty much All-In to Flash it Back for a total of 16 Hasty Fire Kitties. I swing for 32 (Oriflamme) to Kill Maelstrom Wanderer. Since Lazav died somewhere in there, too, I win! 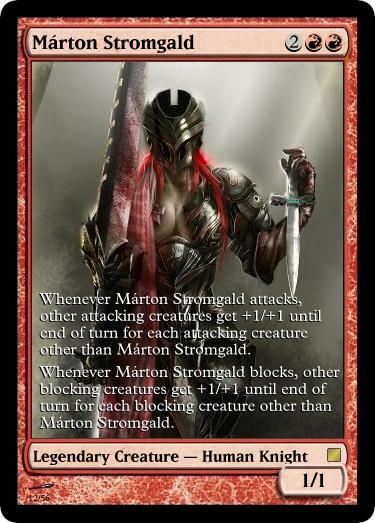 Marton Stromgald was the first Legendary Creature I ever cracked in a pack (well, an Ice Age Starter Deck in the Food Court at Miller Hill Mall in Duluth. I was so psyched because it was my #1 want from the set). The plan for this deck is to play many creatures (preferably ones that are 2 power or less) quickly and then get things like Meekstone and Ensnaring Bridge (which is rad with Grafted Skull Cap and 2-power creatures) as well as stuff that only pumps Attacking Creatures (Hooray for Battle Cry). Then I turn Marton and everyone Sideways as much as possible without fear of retribution. There’s some Token Generation going on as well. I may throw in a Purphoros some day as an extra bonus, but I kind of like just attacking a lot. Moonveil Dragon is a Boss in this deck, even though she doesn’t really get to attack if things are going correctly. I start with 2 land and a Tormod’s Crypt and a Scroll of Grislebrand. Sol’Kanar has Sol (ka)Ring and puts a Darksteel something or other onto a Prototype Portal, and soon plays Nicol Bolas, Planeswalker. Rorix is doing stuff with artifacts and plays a Voltaic Key. I manage to get a Reassembling Skeleton out. Sol’Kanar casts Windfall, and I am happy because I have to get land, right? Nope I get 1. (this deck, while playing 40 lands, is always mana screwed). This is somewhat Demons and Devils tribal, but not really, and lots things to make people lose life so that Rakdos can make things cheaper. Other than that, it’s just an Aggro deck. Doran hit the table early, but was Rapidly Hybridized. Despite a 3 land opening hand, I stalled at 4 lands and was quickly overwhelmed by Garruk, Avenger of Zendikar and a bunch of other things. This was the first try on a new deck, so we decided to play a second game. Doran hits on turn 3 again, and there’s a Deadbridge Chant, Oracle of Mul-Daya and a Treasury Thrull in the mix as well. I was able to play Melek though, as well as a Reliquary tower and a Hypersonic Dragon. I was able to play a doubled Act of Treason, but drew a Bribery, missing out on double casting it, however I did Bribery for an Avenger of Zendikar and an overloaded Dragonshift let my plant tokens become Dragons long enough to fly in for the kill. There’s a good mix of theft, token generation, and combat buffs to make winning via beatdown a possibility. It has some library manipulation (scroll rack) to try to maximize Melek’s abilities. I enjoy trying to cast Haze of Rage as many times as possible in a turn. My new hand was playable though (it had at least one of each color). Varolz was on the attack out of the gates, with a Hypnotic Specter and a Survival of the Fittest. The Hippie was aimed at Kumano. I spent the early part of the game playing lands. I got to 4, and was hoping to cast Assmble the Legion, when Kumano spun the Wheel and we all drew 7. I drew 4 lands, a Cluestone and an equipment or somthing minor. My two weenie dudessat on the table, and I literally just dropped lands for the next few turns. Linvala was building up a good army, and dropping Swords left and right. One got exiled by a cat, the other got Oblivion Ringed by me after it pinged me for 2. Akroma had also come out to play. Varolz got a Sylvan Primordial and picked off one of my lands (usually I hate that, but it wasn’t so bad with a hand full of them), and then Survivaled for Sheoldred. Thanks to Linvala’s Extraplanar Lens, I had tons of mana. Just nothing to cast. I chump blocked Sheoldred twice (dudes were gonna die on my turn anyway). Then Linvala, my secret hero, played the “destroy all non-white stuff” spell and saved us from Sheoldred. Kumano hadn’t had much of an impact on the game, or was at least leaving me along. Now that I could cast things, I got started. First I put a Boros Charm on a Spellbinder, played Aurelia, equipped and swung, hitting Varolz for 9 after casting the double strike mode before the 2nd attack. I also did 8 damage to Linvala with the other two Spellbinder triggers. However, Varolz pulled back the damn Sylvan Primordial (Reach… ugh) and also popped my spellbinder. Linvala cast Day of Judgment, and Marshall’s Anthem-ed back Akroma. Kumano and Varolz continued to fight each other, with Kumano DragonStorming out 3 dragons, and I was able to sneak in Odric, Master Tactician, Darksteel Plate and a Sunforger. Before my turn I Rallied in two soldier tokens. On my turn I had enough to re-cast Aurelia and Equip the Sun Forger AND cast Battle Mastery on her, which gave me 4 creatures ready to attack… A lot. I needed both Attack steps to eliminate Varolz and Kumano, and was also able to land some General Damage on Linvala. Odric had decided that there would not be blocking happening at this point. However I was at low enough life that Linvala’s counter attack would have finished me off (since I couldn’t block Akroma), luckily I was able to throw a magic hammer and find an Angel Song to keep myself alive and hang on for the victory. 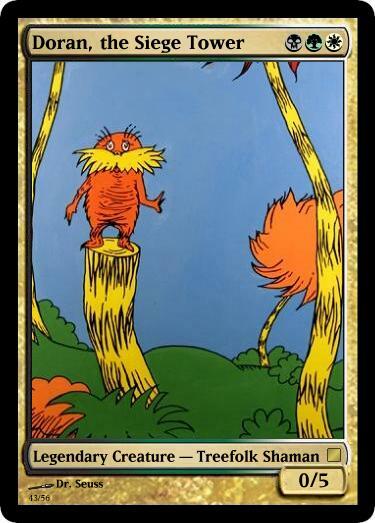 This marks the 2nd time in this project that one of my Aurelia decks has pulled off a WTF style victory. After playing an 8-pack Modern Master’s Sealed (I didn’t win the Tarmogoyf lottery… Sword of Light and Shadow was the only card of note in the box), I got a chance to play some EDH. I had to lend one of my decks (Angus/Agnes McKenzie) to my friend, since he didn’t bring any EDH decks. I went first and dropped an Urborg. I had another swamp, a dark ritual, Hatred and Howl from Beyond in my opening hand. I played an early Reassembling Skeleton and a Corrosive Mentor. Angus did a lot of ramping (the deck is based around landfall/land tricks and some token tricks), Crovax tutored for a Land Tax and played a Skull Clamp. I got out my general on turn 5 and then used my ritual to play a Butcher of Malakir. I attacked Crovax for 4. The butcher got Swords to Plowshares-ed. Angus had a Patern of Rebirth on a Fertilid and Crovax had an Aura of Silence. I attacked Angus, hoping to draw Crovax to sac the Aura (so I could safely play a Wound Reflection) to destroy the Pattern. He didn’t (“I want to see what he’ll get”) and Meloku,the Clouded Mirror was reborn. Angus then played a Mirror Sigil Sergeant. Crovax was building up a small army of Soldier tokens via Mobilization. I played a Strands of Night and a Nefarox. I got a few attacks in with Nefarox, but was met with blockers (spirits from Meloku). Both opponents built up sizeable token armies. I sacced Nefarox to Disciple of Bolas. The following turn, I cast Mutilate for 9 and then reassembled a skeleton which was then sacrificed to Victimize, which got me back a Nefarox and Corrosive Mentor. Aura of Silence killed my Strands of Night, which allowed me to cast Wound Reflection. Angus played a Storm Cauldron, as a delaying tactic, which put both me and Crovax in a bind. Angus copied a crovax’s Reya, Dawnbriger with a Vesuvan Doppleganger (playing under M14 rules), and used Scouting Trek/Treasure Hunt to get the last few basic lands into hand. I used a Xenic Poltergeist to animate the Cauldron and Crovax sucked it up and cast a Martial Coup. I followed up with a Massacre Wurm, but Crovax used a sac-outlet to prevent himself from losing 20 life. I recast Ashling. Angus used Trade Routes to keep drawing cards. 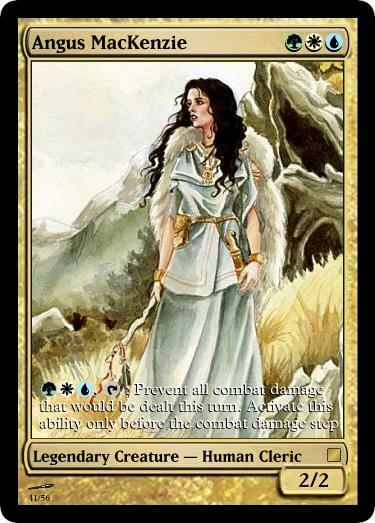 I saw an opening that could win me the game: I gave Ashling Swampwalk with an enchantment, attacked Angus (at 18 life) and, anticipating Wound Reflection, cast howl from beyond to put her power to 9,(before blockers, as I assumed her unblockable). She got Cytoshaped into a 3/3 green centaur with protection from black, knocking the enchantment off and making her blockable. I had hoped to repeat the process the following turn using Hatred to do the last 17 General Damage to Crovax. Instead Ashling died. Crovax StoneCloaker-ed my Skeleton. I cast a Shelodred, which got Parallax Waved away. I cast an Avatar of Woe and then attacked with a Hunted Horror, which would have killed Angus (no general on the board), but he Mirrorweaved everything to Avatar of Woe and then events lead to my board being wiped of guys. I made a last attempt with a 24/24 Umbra Stalker, but there wasn’t much I could do at that point without evasion. My hope was to get Sheoldred to get back a Disciple of Bolas and gain 24 life and draw 24 cards. Instead I died to damage from giant soldiers. The game continued on for quite awhile with lots of back-and-forth. Tradewind Rider vs Isochron Scepter (Disenchant), Sundial of the Infinite tricks to save creatures. Eventually a Catapult Master was able to take control and Angus fell (at 6 life for almost an hour). Crovax only took 4 damage (from Ashling) the whole game. It was long, but fun. My friend who played my Angus deck is a good player, and I like letting him play my decks (1. because they are bad, which gives me a chance against him, and 2. because he does well with whatever he’s given). However, the night had gotten late, and he had to go home. This deck started out as being a deck about “Black Cards with Purple in the Art”, but became a super-mono black deck (every card in the deck, with the exception of Thespian’s Stage and Urborg, which is pretty darn black) has Black Color Identity. It was going to be ‘sacrifice matters’ but I had too many ideas and cards selected, so I chose to limit it to being only ‘black’ cards. It has a “Swamps Matter” sub-theme, and it’s really fun to play Umbra Stalker with a big Chroma count. I really enjoy playing this deck. It’s not subtle, it’s not control, it’s just black aggro.